My father irrigated China's freedom and set Taiwan free of colonial rule as a nationalist young soldier. He walked 1000 miles during the anti-Japan resistance battles. Based on this standpoint, I write to urge KMT Party Chairwoman Ms. Hong to please not liquidate the KMT assets. According to former KMT Chairman Ma who is a legal expert and Chairman Zhu Lilun, who has a Ph.D. in accounting, both claim that KMT has already cleared out all “disputable” party assets. Taiwan’s ruling DPP party and diehard fans have values differing from world values. For example, in the US a person is presumed innocent until proven guilty. In Taiwan, people are labeled as having “original sin”, so they must be purified by going through “transition to justice”. In the United States, a person is considered innocent until proven guilty. The 14th amendment to the US Constitution guarantees to every person, including aliens, equal protection under the law. Why sentence KMT minorities to possess “original sin”? The US Constitution 14th amendment specifies innocent till proven guilty, this should be true in Taiwan also. Why coerce minorities to be forced to "transitional justice" so they must turn in everything to Taiwan people? We want to address the issue of Transition to Justice. With this assertion, you are guilty without a trial, and the DPP embarks on demanding KMT party assets to be turned over to Taiwanese hands because the KMT possesses the "original sin", so the KMT must give up everything and liquidate its party assets. Who were the Payees to Raise the ROC military Troops? Please see the gold receipt from the historical archives of Academia Historica. The ROC military was paid from different provinces in China. KMT party Chair Ms Hong wants to sell all party assets, gave party workers pensions, leaving a skeleton office with few workers, and give the rest to Taiwanese charity programs. One thing Chairman Hong must understand is that according to the ROC Constitution, Taiwan is one of 35 provinces of China. When the Nationalists retreated to Taiwan in 1949, they moved gold reserves from provincial banks in 35 provinces to Taiwan province. So, the KMT Chairman has no right to distribute funds solely to Taiwan alone, as KMT assets belong to all the provinces' people because of their contributions over generations. 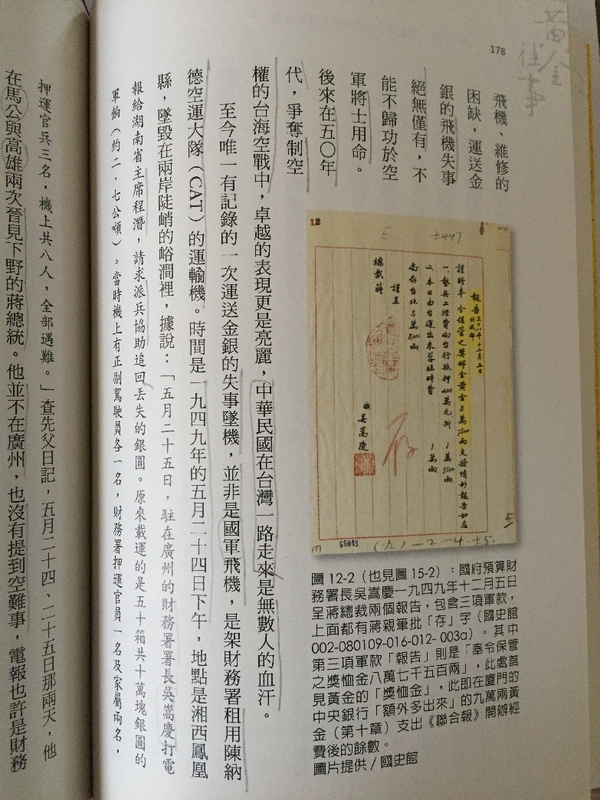 You may verify from this book by Author Wu Xingyong, "Gold History". Recently, the Tsai government’s presidential house finance ministry clarified that Taiwan’s economy is safe and sound and there is no worry for bankruptcy. Pension expenditure is less than 7% without counting foreign reserve and bank reserves. As this is less than 2 months from last President Ma’s departure, we should accredit this to his clean integrity. 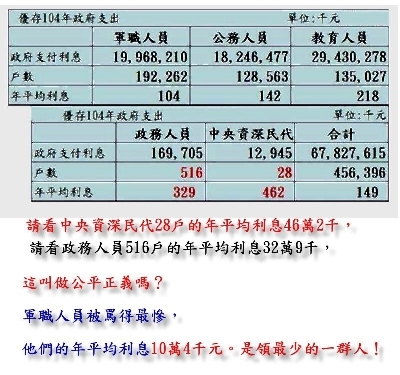 Please verify according to this chart that military pension annuity is the least, 104,000 NT (1 US dollar=32.6 NT), public servants get 142,000, education gets 218,000, political affairs officials get 329,000, central senior delegates 462,000. The military gets the least but because they are minorities, they get the most insults. Comparatively, when President Chiang Chingguo left office in 1988, the affluent national reserve was looted and depleted. Taiwan south underground radio broadcasts that KMT has tens of trillions, so even if Chair Hong donates 1 trillion NT, it will not be sufficient to quench their thirst to persecute using the excuse of transitional justice. KMT minority evicted colonial Japan fascists out of Taiwan, and came to make a living in Taiwan as the mainland was occupied by Communist Mao. If this is the original sin, what is the difference between Jews fleeing Nazi oppression? Taiwan is just one province, you can’t give all of the gold from the mainland just to Taiwan and confiscate everything from the KMT and give it to Taiwan people, who were on the side of colonial Japan, which President Tsai and former President Lee Teng-hui refer to as their motherland. Perhaps the so-called transition to justice is to return Japan the shame of surrendering unconditionally. After World War II, Taiwan had no rice, despite it is a rice-growing region, with three harvests in one year, because all of the rice was sent to the Japanese soldiers abroad. Post-war, December 7, 1945, Taiwan provincial executive Mr. Yen Jia-gan received the first ship with relief food and supplies from Shanghai that he had requested. The author of the gold history stated that 87,500 ounces of gold was the reserve for the nationalist soldiers’ widows and orphans, refer to the first photo figure. Taiwan people were not robbed to pay the military. A recent news reporter by the name of Hong Shu-zhu, hired by the Taiwan Civil Government to harass 80-year-old veterans by shouting "go home, Taiwan people don't want to feed you", this video shocked the entire PRC 1.3 billion people. If something like this happens again, DPP should be investigated and held accountable by the world’s human rights organizations. In name of Transitional Justice, the DPP wants to abolish the ROC name and change it to “Taiwan”, change China Airlines to Taiwan Airlines, and change the flag to have a picture of Taiwan, in other words, change everything referring to China to become Taiwan only. The Republic of China flag, is derived from the Chinese Kuomintang flag on behalf of the KMT sacrifice and dedication to the country's love, with no regrets. We are the source of the spirit of Chinese culture since the establishment of the Kuomintang. The construction of the ROC national institutions, was gradually improving, despite the war against Japan, the staff still governed the provinces politically and held conferences, over many years, and finally on 1947 New Year's Day issued the ROC Constitution. KMT's spiritual and financial assets are the efforts of wise people. There were some unscrupulous people who took money, the chairman should go after these people to restore the money back to ROC national assets, but not totally liquidate all KMT assets. You may give a relative portion to Taiwan people, because according to the ROC constitution the sovereignty govers the entire China, not only Taiwan.This is the main difference in identity between the KMT and DPP, the DPP considers themselves Taiwan only. This cash and gold was derived from many different provinces in China. Please do not liquidate nationalist assets, the fruit of the struggle of millions of people from China mainland. Even if all of the material assets are deleted, you still cannot remove the spiritual historical contribution of the righteous KMT.